News | Sturgis Economic Development Corp.
STURGIS (3.2.2018) — No pompoms or hometown pennants were waved, but a gathering to promote economic opportunities in Sturgis Tuesday had the feel of an old-time pep rally. City Manager Daniel Ainslie and Sturgis Economic Development Corporation (SEDC) Director Pat Kurtenbach served as cheerleaders, giving an overview of past development successes and opportunities ripe for the picking. 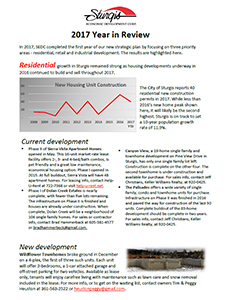 After the results of a housing study back in 2014 showed the need for all types of housing in Sturgis, the city and SEDC sought out developers to come build homes. “We had three developers come in who have added $35 million in construction following that,” Kurtenbach said. Invites for Tuesday’s event were sent to contractors who are registered in Meade County as well as to larger construction contractors from Spearfish and Rapid City. Kurtenbach said she was pleased with the turnout and hopes it will result in some follow-up calls from contractors. “Until we sit down at the table and talk to developers about what their plans are and what we are able to offer them, we won’t know what’s possible,” she said. The meeting was a way of putting the hook in the water, Kurtenbach said. “It was our way of saying, ‘Take a look at us,’” she said. Among those in attendance were Bradley Kurtz, president of Dean Kurtz Construction of Rapid City, along with Stephen Burgess, the company’s vice president of operations. Kurtz said he found the information presented valuable. “It’s a little bit surprising at how aggressive they are getting, including providing incentives to get things going here,” he said. Sturgis currently has about 240 acres of varying sized properties available for sale for both commercial and residential development, Ainslie said. Some measure only a quarter acre on land adjacent Junction Avenue to 30 acres on either side Lazelle Street near Interstate 90’s Exit 30. Among incentives offered to developers is Meade County’s 100 percent, five-year property tax abatement on commercial construction and on four-plex and larger housing. Ainslie said the city also works to expedite its permitting process for developers along with offering tax increment finance districts. For a copy of the complete presentation and available properties, click here. RAPID CITY (3.5.2018) | Elected officials, local leaders and economic development professionals will gather in two Black Hills towns April 4-5, to learn more about attracting new businesses to their communities. Hosted by the Rushmore Region Economic Development Alliance, the workshops titled, “Preparing Today for Tomorrow’s Growth,” will allow elected officials, local community leaders, and economic developers to gauge their preparedness to respond to businesses looking to relocate and to better understand what those businesses are seeking, said Rushmore Region Chair Pat Kurtenbach of Sturgis. The free half-day sessions are set for April 4 in Hot Springs and April 5 in Spearfish, Kurtenbach said. They will allow participants to gain an insider’s perspective of what businesses look for when they consider choosing a new location, understand site-selection mega-trends, explore special considerations for economic development in our region, and learn how to market to site selectors, she noted. Ady Advantage, a Madison, Wis.-based economic development and marketing consulting firm, has worked with dozens of communities and companies throughout the U.S. to identify “best-practices” and help its clients position themselves for growth, Kurtenbach said. For more information, or to register, go online at rushmoreregion.com/advantage. Please join the SEDC Board of Directors in welcoming Just for Looks and Richter’s Tire & Exhaust as new SEDC investors. The SEDC Board of Directors thanks the Meade County Commissioners for re-affirming the County’s current discretionary formula. In place since 2010, it provides 5-year, 100% tax abatement on new commercial construction, including residential 4-plexes and larger. During nearly two hours of testimony on Nov. 8, the Commission heard directly from Scott Peterson Motors, Rasmussen Mechanical and Jake’s Garage about the importance of this economic incentive in their decision to expand or relocate in Meade County. Others such as Indian Motorcycle Sturgis, Landsport, Belle Joli and Sierra Vista sent letters of support outlining the significance of the program to their business. SEDC, officials from the cities of Sturgis and Summerset, and the Meade County Equalization Office also addressed the Commission. This discretionary formula is an important tool for us to have in our economic development toolbox and the County is an important partner. Thank you! Another important Thank You goes out to all community volunteers – individuals and businesses – who supported the fund drive to purchase holiday decorations for the new Sturgis Main Street. Through the “Christmas in July” campaign during Music on Main and August’s Community Picnic, the Downtown Sturgis Foundation was able to outfit over 30 street lights with traditional garland, wreaths and sparkling lights. Special thanks to Black Hills Energy and the City of Sturgis for their generous contributions and excellent installation. The City of Sturgis and the Downtown Sturgis Foundation are working on projects that will continue to improve the Main Street corridor. In 2018, events at the H-D Plaza should be more comfortable with the addition of shade panels. The first in a series of permanent public artwork will be installed in front of Wells Fargo Bank. SEDC continues to work the retail prospects we met through Buxton during the retail trade show in May. As recently as October, the City and SEDC hosted site tours with national retail affiliates. Courting national retailers can be a long process. For example, Dollar General first toured Sturgis in 2012. They opened on Lazelle in 2017, a full five years later. Maverik removed their “Opening 2018” sign from their Junction Ave/Anna St. lot. They notified the City they would not be proceeding with new construction at this time, intending to slow the current growth of new store openings. SEDC welcomes The Moving Guys to the incubator building at 1110 Industry Road. Owner Chad Moyers and his 6-person crew moved in in October. The 3,360 sq. ft. unit gives Chad the ability to consolidate his office and various storage areas into one. He can now grow his retail business to include all types of moving supplies, such as boxes, tape, packing products, etc. For large or small, local or long haul moves, contact The Moving Guys at (605) 877-2258. A new 9,600 sq. ft. spec building in the Sturgis Industrial Park is ready to be finished for a tenant or owner. With the foundation, roof and walls in place, the rest can be customized for any type of manufacturing application. Contact SEDC for more info. Dolan Creek Estates’ Phase I is nearly sold out, with less than five houses and five lots available. Phase II infrastructure is now complete and four houses are already under construction. Dolan Creek member Brad Hammerbeck says these 58 new lots will offer more diversity and views. Local developers are encouraged. For more info, contact Brad at 381-4577 or bradhammerbeck@gmail.com. Sierra Vista is a great low maintenance, economical housing option. The landlord pays for water, sewer and garbage. Snow removal and lawn care are also included. Tenants don’t need to worry about maintenance and repairs, just call the landlord. The units are quiet, comfortable, and new! They also offer great views with easy access to I-90. Contact Help-U-Rent at 722-7368 or click help-u-rent.net. Wildflower Townhomes. Plans on this 12-unit, ground level residential development are being finalized and groundbreaking should start very soon, depending on the weather. Located on the site of the former Francis Case elementary school, the project will include three 4-unit townhomes, each with 2-bedrooms, a 1-car attached garage and off-street parking for two vehicles. Available as lease only, tenants will enjoy carefree living with maintenance such as lawn care and snow removal included in the lease. For more info, or to get on the waiting list, contact SEDC or owners Tim & Peggy Heuston at 361-563-2522, heustonpeggy@gmail.com. Congratulations to the Jackson family and Belle Joli Winery for their role in christening the USS South Dakota submarine. Their 2013 Estate Reserve, bottled and processed at their Belle Joli Sparkling Wine House in Sturgis, was chosen for the christening ceremony. This honor comes only three years after opening their Sturgis production facility, the first such operation in the state. Belle Joli’s sparkling wine is a 100% South Dakota-made product using grapes grown in their Belle Fourche vineyard and made in Sturgis using champagne methods. The USS South Dakota is an attack submarine and the first underwater vessel to bear the state’s name. About Dakota Rising: Dakota Rising is a free 3-year entrepreneurial development program designed to provide rural start-ups with tools, resources and connections to help them reach their greatest potential. In return, the Fellows use that potential to impact rural economic and community development. Other recent local Dakota Rising Fellows are: Chad Gollnick/Iron Outfitter (Black Hawk) and Jenni Tucker/Help-U-Rent (Sturgis). STURGIS, SD (9.20.17) – The City of Sturgis won a Gold ‘Excellence in Economic Development’ Award for its Winter Storm Atlas Recovery & Catalyst of Growth Campaign, a project in the category of Multi Year Economic Development of the International Economic Development Council (IEDC). 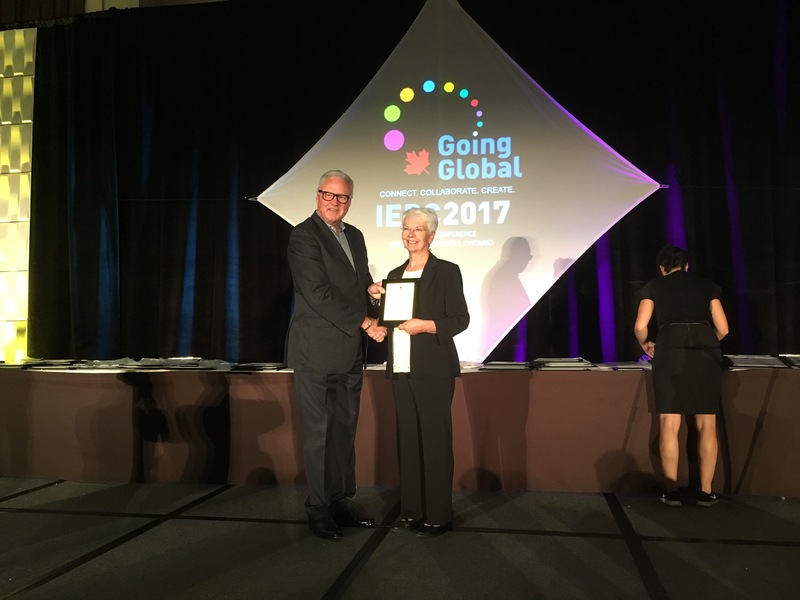 The honor was presented at an awards ceremony on Tuesday, Sept. 19, during the IEDC Annual Conference, held in Toronto, Ontario, Canada. 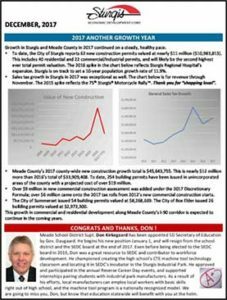 “On behalf of the IEDC board of directors and Excellence in Economic Development Awards Advisory Committee, congratulations to the City of Sturgis. Not only did they work to provide a necessary service to their community; but also, their participation in the awards program sheds light on their stellar projects which other communities can now use as a benchmark.” – Michael Langley, IEDC Board Chair. Throughout Oct. 3-5, 2013, Sturgis and the surrounding Black Hills region experienced Winter Storm Atlas. The storm began with a large heavy rainfall and developed into up to 4’ of heavy wet snow being dumped on the community. The immediate aftermath saw hundreds of thousands of cattle killed, dozens of buildings partially or completely collapsed and weeks of snow plowing and debris removal. During this recovery period, the City of Sturgis partnered with the not-for-profit Sturgis Economic Development Corp (SEDC) to ensure that every affected business was able to temporarily relocate and eventually rebuild. The reconstruction effort led to significant expansions and no fewer than six new retailers opening in the rural community. This significant expansion caught the attention of the local media, which in turn helped to catalyze more residential, commercial and industrial expansions. In the time following the Presidentially-declared disaster, the community has continued to see the largest economic expansion in its history with sustainable growth in all sectors. STURGIS, SD (8/1/2017) –Wildflower Townhomes, a 15-unit residential community, is coming to Sturgis. Located on two acres surrounding the former Francis Case elementary school, it is designed for people of any age who want carefree, ground level living. Owners/developers Tim and Peggy Heuston will host an informal public “Meet and Greet” on Friday, August 18th, from 5:00 – 7:00 pm, at the Sturgis Area Chamber of Commerce. They encourage potential tenants and anyone interested in looking at the plans, including those in the construction trades, to stop by to learn more about this exciting residential community. Construction plans will be finalized over the winter, with groundbreaking for the first townhomes in Spring 2018. The 2-bedroom leased townhomes will have attached garages with off-street parking and include lawn care, snow removal and external building maintenance. The Heuston’ state, “We are so excited for this opportunity to return to South Dakota and the beautiful Black Hills. Sturgis is a progressive, unique city in such a pretty setting. The City and SEDC have been very encouraging, and we really appreciate the warm welcome. One of the best experiences of our lives was building a similar development in Pierre. We are confident that Wildflower Townhomes will offer Sturgis another quality housing choice, and we look forward to putting names with faces at the “Meet and Greet”. Look for car repair services that are always on the go? Orlando Mobile Mechanic can do just that. They are a mobile car repair shop who can travel to you in case your car breaks down. Sturgis, SD – 6.6.17 Gov. Daugaard says he enjoys the Capital for a Day program because it gets him out of his office to meet people where they live and hear about their challenges and celebrate their successes. People around the nation talked about how Washington, D.C. can be like an island. Daugaard said Pierre can be like that also being isolated from the rest of the state. Daugaard said Sturgis has a lot going for it and has always been known to think big. He was thoroughly impressed by the new Sturgis Main Street during a walk Tuesday morning with Sturgis Public Works Director Rick Bush. Daugaard characterized Sturgis as a community responsible for making its own future. Daugaard said communities can’t wait for businesses to need a location, communities need to provide that location so that when businesses are looking, proactive communities are in the running. “Sturgis does that,” the governor said. Daugaard also lauded the Meade School District for its commitment to career and technical education or CTE. “Because the firearms industry is very active in Sturgis, the school system has a machinist program with up-to-date modern equipment. I know that because I gave a grant to help buy it,” he said. The Sturgis motorcycle rally is what draws people to Sturgis and the entire state from all over the world. And Sturgis is learning to leverage their hospitality to other events year-round, the governor said. Daugaard gave as an example the pavilion at The Knuckle Saloon which serves thousands of bikers during the annual motorcycle rally, but also uses the venue for a bull-riding event during the summer when rodeo fans are in town for the Southwest Regional High School rodeo. “That just shows you take your assets and don’t just rely on them for the obvious – like the rally – but use them in other ways to create more interest in Sturgis,” he said. Daugaard was excited to visit the Sturgis Watershed area during his visit Tuesday and said opening that area to visitation is just another example of Sturgis using its assets to the fullest. “The city has been very active in making the decision to open up that area formally to the public. The welcome mat is being rolled out and this government-owned asset is being made available to the people,” he said. Whether it remains a city-owned asset open to the public or becomes a state-owned asset is open for discussion, the governor said. Sturgis Mayor Mark Carstensen said the city and state have collaborated on several projects in recent years and the city was proud to be able to showcase those efforts during Daugaard’s visit to the city Tuesday. “As we tour businesses in the downtown corridor and in the industrial park, we are truly grateful for the support we have received from state agencies,” Carstensen said. A noon luncheon Tuesday, dubbed a Community Leader Roundtable, was a time for discussing new ideas and to set new goals that will help not only the community of Sturgis, but also the state to continue to thrive and grow into the future, the mayor said. PIERRE, S.D. (5.16.17) – Gov. 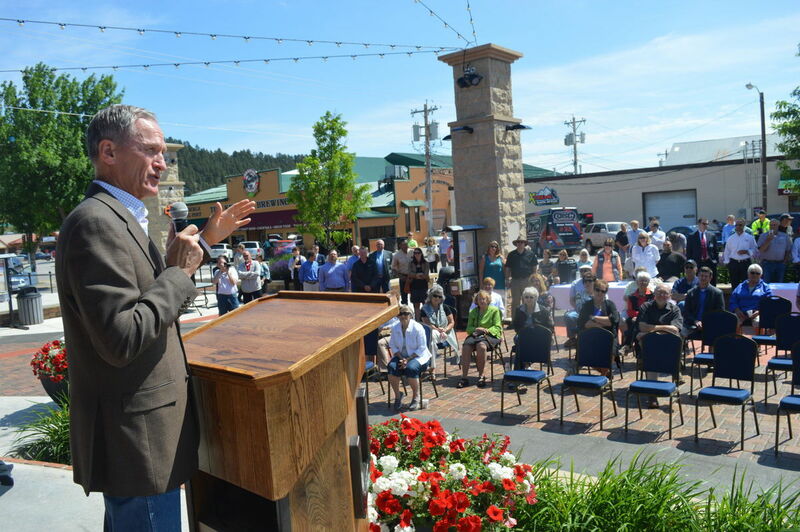 Dennis Daugaard announced today that Sturgis has been chosen to be South Dakota’s Capital for a Day on Tuesday, June 6. The Governor’s activities for the day will include a Main Street walk, business tours around town, and a community social and coffee hour. The Governor will also hold a roundtable for community leaders to meet and discuss the needs of the city. A complete agenda will be released at a later date. Sturgis, SD (4/21/17) – At the Annual Meeting of Members of the Sturgis Economic Development Corp (SEDC), it was announced that Scott Sabers (Sabers Insurance Agency) and Jeff Dragseth (CBH Cooperative) were re-elected to 3-year terms on the Board of Directors. New board member Ken Meirose (Black Hills Energy) was also elected to serve a 3-year term. Mutch Usera (Black Hills Energy) retired from the board after serving a 3-year term. At SEDC’s April Board of Directors meeting, the 2017 slate of officers was chosen. They are: Paul Bisson, Chair; Scott Sabers, Vice-Chair; and Scott Reiman (First Interstate Bank), Treasurer. The other 2017 SEDC voting board members are: Don Kirkegaard (Meade School District), Clint Brengle (The HomeSlice Group), Lonnie Isam (Competition Distributing), Ron Rosenboom (West River Foundation), Irving Stone III (Bar-Sto Precision Machine), Daniel Ainslie (City of Sturgis) and Galen Niederwerder (Meade County). Ex-officio non-voting members are: Dave Martinson (City of Sturgis), Kirk Chaffee (Meade County), Heidi Kruse (Sturgis Area Chamber of Commerce), Pat Kurtenbach (SEDC) and Vickie Harter (BHSSC). About SEDC: SEDC is a private non-profit economic development agency formed in 1973. Its mission is to actively pursue economic development by assisting new or expanding business and industry in Sturgis and the greater Meade County area.